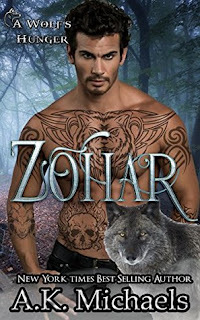 I am so excited that we get Zohar' story. I have adored this man aka Enforcer since the beginning. Zohar is the council's enforcer, and he believes himself too far in the dark for any chance at ever having a normal life. Well, that is going to go right out the window. Zohar gets a favor called in by Shade. So it's Zohar and Danko off to put a stop to an abusive Alpha. Danko knows exactly what's going on with his friend and is going to do all he can to get him to open his eyes and believe in the fates. Enter one meek and small female named Maisy. She has endured a life of severe abuse and that all comes to a head one fateful day and she loses yet someone else that she loves. Absolutely my favorite by far by this author. Can not wait to see who the Hunger attacks next. I believe these books can be read alone, but I would suggest you start with book one in the series, so you know everyone as they intertwine.